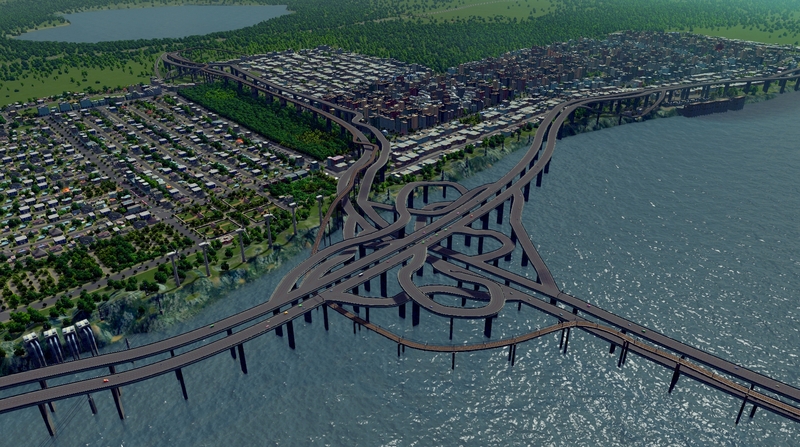 Growing up as a Warhammer obsessed teen, dreaming up cities with pristine infrastructure wasn’t my top priority. No, that coveted position was given to slaying AWP-ers in CS: Source with ridiculously lucky (i.e., skilful) AK headshots every morning before school started. When university rolled around, and the daily hour-long bus-train voyages kicked in, my appreciation of city design bled into my gaming tastes. More recently, I started getting into Rollercoaster Tycoon and SimCity 4 after discovering the freedom they offered and satisfaction I could take from them. Unfortunately, nothing has come out lately that has captured that same freedom of creative design with the same fluidity or satisfaction in mind… Until Cities: Skylines. Simply put, it’s the game that SimCity 5 should have been. Cities is a game about city-building, which either sounds like a riot of a time or something that your creepy neighbour plays when he’s not talking to your dog. You build roads, designate zones for development and build statues to commemorate what an excellent mayor you are, as well as implementing other infrastructure to keep your citizens happy. It might sound like a chore, but it’s a very Zen-like experience, and watching your city grow can be as gratifying as a free bowl of ramen. While it might not be for everyone, Cities is an excellent place for newcomers entering the world of good park placement. As far as city building goes, Cities offers players one of the easiest and quickest building mechanics around. Building roads is as easy as it is flexible, with only a couple clicks making a road with the exact contours and length you want. Zoning is just as easy with the tools for designation available to you, including ‘painting’ over eligible areas with a brush for quick zoning over huge areas. You’re also equipped with info views – much like those in SimCity 5 – that give intuitive visual feedback on different city issues, like pollution or noise levels. It’s easy enough to pick up without too much of a helping hand, but the game makes sure you aren’t overwhelmed with choice too early on. When you first start building your city, most of the buildings and regions of the map are locked off. As you reach population milestones, you gain access to more roads, buildings, public transport options, loans and regions. It’s frustrating if you already know what you’re doing, but it’s helpful when you’re coming to grips with the interface and tools in the game for the first time. It also acts as a motivator for making your city bigger and bigger, which you are highly encouraged to do by your faceless advisor. That said, you can turn these restrictions off with a mod, as well as unlocking the whole map, downloading new assets, and just about anything else. One of the big selling points of Cities is the mod support. Sim City 4, the untouched holy grail of city building games, maintained its place atop the throne of sims because of its dedicated modding community. The game was already solid, but the mods made it phenomenal, and Colossal Order seems to be ensuring something similar happens with Cities. With a team numbering in the teens, Colossal Order simply didn’t have the manpower to churn out art assets a la EA with Sim City 5, but a dedicated fanbase is an amazing thing. The game includes an asset editor and the Steam Workshop built into the main menu, and, uh, well, people are using them. As of writing, there are mods that let you unlock the whole map, hundreds of new art assets, and plenty of new maps people are sharing around. There are mods that change how the camera operates and mods that allow for new types of pathway. If you want, you can even import real world terrain (including Perth!) to play with. This freedom to mod isn’t just a nice feature, it’s a selling point of the game, and it adds a heap of potential variation to the game. It’s a nice (probably unintentional) jab at SimCity 5, which restricted modding and supplied overpriced DLC instead. If it seems like I’ve been mentioning SimCity 5 a lot, it’s because, in many ways, they are almost identical. From their easy-to-grasp mechanics to the presentation of information, it’s difficult not to compare Cities to SimCity 5. The resemblance is startling, to the point where even the UI has a similar layout, but there are several key differences between them. First and foremost, there is no multiplayer component, which makes a lot more sense than getting your friends to trade resources with you. The scope of the game is much more focused on building a city how you want, not challenging you to fit as many people as you can into a tiny space. The other big difference is that the simulation is a lot more nuanced. A big problem with SimCity 5 was the simplicity of its simulation, but Colossal Order have taken their experience from Cities in Motion and built upon it. Not everything translated over (parks and metro stations need road access, not just pavement), but it’s better than citizens filling up the nearest empty home they find each day. 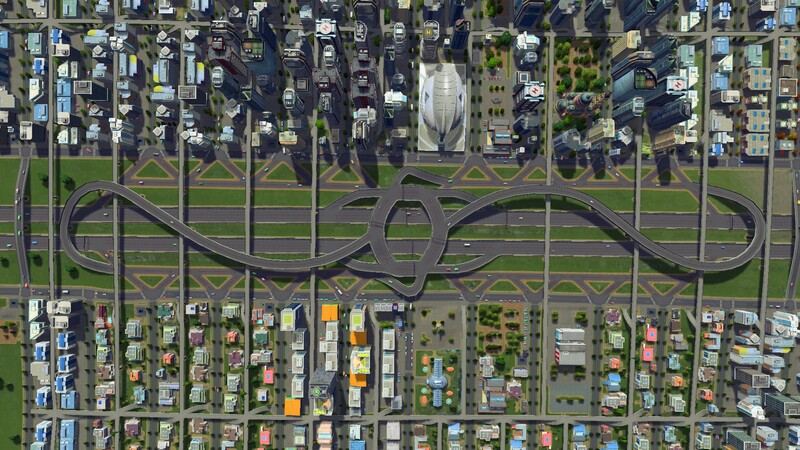 However, there are areas in which Cities still failed to learn from SimCity 5’s mistakes. Despite it’s improvements, Cities still fails in one key area: specifics. The three demand bars at the bottom of the screen are as much info as you get on what kind of zoning my citizens wanted. This wasn’t a huge issue for residential zones, but I would have liked to see a distinction between industry and offices, as well as low and high-density commercial zoning. I also couldn’t mess around with lane directions, which got annoying when I couldn’t draw out my one-way road from the destination. I’m not hugely worried about it though; someone’ll probably make a mod to fix any problems I have. The only other problem was the simple nature of the game, something that’s more preference than hard criticism. While the game is still less simplistic than SimCity 5, it’s still a fairly dumbed down and easy experience. Is that necessarily a bad thing? I don’t think so. This is, after all, a game, not a hard simulation that civil engineers would use to model their cities with in future projects. Keeping your citizens happy is important, but the focus of the game is balancing creativity and practicality to make something you can be proud of. Looking at some of the cities the community has made, I just get hugely depressed at how generic my city is. My people are happy though, and I’m proud of that. Still, my designs could look better, especially since the game is pretty stunning itself. 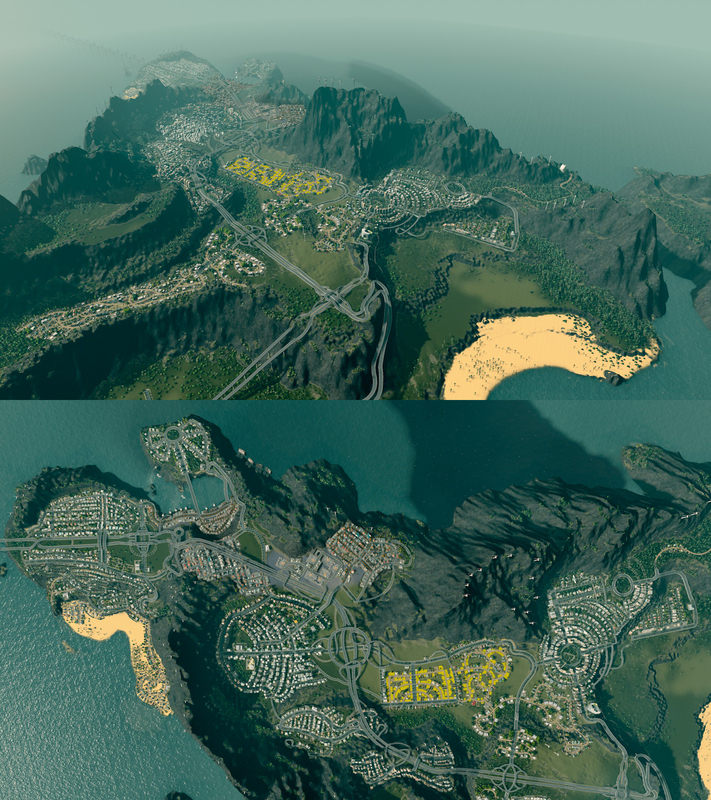 If you haven’t seen some of the community’s Cities, oh my god, look at this madness. From afar, the game is vivid, clear and very pretty, but the crispness fades if you try to inspect the nitty gritty. As you might expect, detail is lost on little things, like grass and dogs, to make sure your computer doesn’t melt, but Cities makes it hard to get a good look at these. The lower portion of the screen is blurred out to hide any imperfections the small art team couldn’t nail. The game also doesn’t allow for street-level viewing (which can be fixed with a mod), which can take away from the feeling that you’ve made a living, breathing city. Mind you, watching your citizens run around helps cement the feeling it’s alive. It might seem odd to dedicate a whole paragraph to this, but watching the occupants of your city go about their business is one of the most satisfying and calming experiences I’ve ever had. Because of the game’s crisp and vivid visual style, you can see where every one of your simulated citizens is going very clearly. I would be lying if I didn’t say I wasn’t hypnotised a couple times just watching my subway system working or when people got off the bus. You can even watch someone’s dog getting walked, which I only ever did five times. It helps put you in the mindset that you aren’t just making a city; you’re making a place where these digital people live. Even if you can’t build a road system that doesn’t stay congested. Like, seriously, how many more lanes do these guys need!? Dogs don’t complain about congestion though. They are perfect citizens. 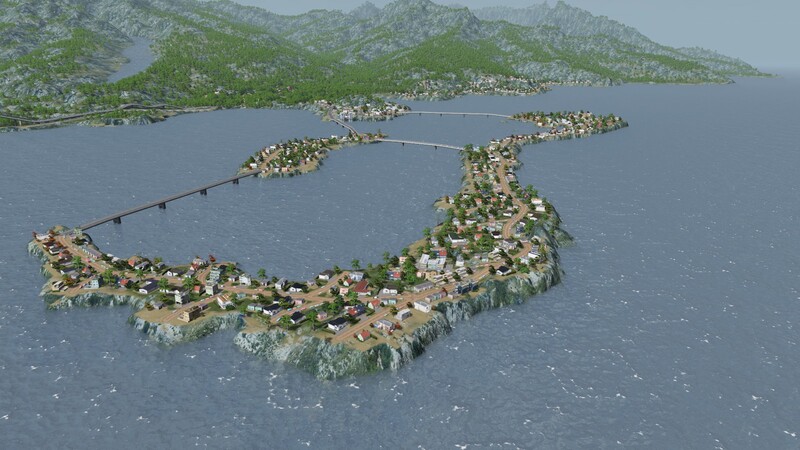 Cities: Skylines is what Sim City 5 should have been. It’s a city game made for city-builders, creative designers and eager newcomers alike. It looks good, it plays well, and the potential variety stemming from the Steam Workshop alone is enough to make you chirp with excitement. There are still tiny details that could have been implemented, but considering the size of the team that made it, Cities is a game worthy of the acclaim it’s getting. If ever there was a game to break the drought of good city-building games, this is the one to do it.